A lot of internet trolls who harass people in the public eye online "move into physical stalking," according to Conservative MP Nadine Dorries. Ms Dorries, who was plagued by severe trolling and physical stalking herself, told Good Morning Britain authorities needed to be better trained and more aware of safety legislation brought in to protect victims of online abuse if the problem was to be tackled. Conservative MP Nadine Dorries has told Deputy Political Editor Chris Ship that MPs' expenses should be abolished, as they have become "toxic" to most voters. Nadine Dorries has been forced to apologise to the Commons for failing to properly register her fee for appearing on I'm a Celebrity. The Committee on Standards said Averbrook Ltd. - the firm which Nadine Dorries' I'm A Celebrity fee was paid to - had "no income from any sources other than her media appearances". Conservative MP Nadine Dorries has apologised to the Commons for what she called "a genuinely inadvertent breach of the rules" relating to registering her fee for I'm A Celebrity. Ms Dorries said in a statement, "I wish to apologise to the House fully and unreservedly for what was a genuinely inadvertent breach of the rules which I have at all times sought to comply ply with." Conservative MP Nadine Dorries is set to apologise to the Commons this afternoon for not properly registering her fee for I'm A Celebrity. Tory MP Nadine Dorries should apologise to the Commons and properly register income from all her media work, a standards watchdog has recommended. Standards Commissioner Kathryn Hudson found that the payments made to Ms Dorries as a result of her appearance on the show should have been declared. The committee's report said: "Ms Dorries contended that such payments were made to a company, Averbrook Ltd, of which she is a director, and that she was not required to register income received by the company, but only any remuneration she drew from it. We find it hard to believe she would have been invited to appear on I'm a Celebrity if she had not come to public prominence as a Member of the House. It is clear that Ms Dorries's media work was remunerated, whether or not those payments were made to her or to her company. 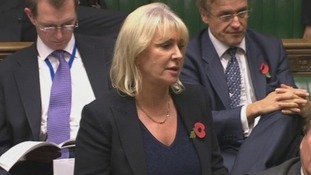 We agree with the Commissioner that Ms Dorries should have registered payments for such media services even though those payments were made through Averbrook Ltd."
The report said that, while her media work may not have influenced her representation of her Mid Bedfordshire seat, it was "likely to have been linked to her work in the House". You can read the report in full on the Standards Committee website. The author of a book that advocates beating children under a year old with paddles said he was "delighted" to discover a Tory MP was calling for it to be banned on Amazon's website. Michael Pearl told BBC Radio 5 Live that if the book is removed from the retailer's website, he will "advertise it as 'the book banned in the UK'". Conservative MP Nadine Dorries asked the Commons yesterday if Parliament could apply pressure on Amazon to remove To Train Up A Child. Mr Pearl told the radio station: "I was delighted to hear that Parliament might ban my book, if they do, I will immediately advertise it as 'the book banned in the UK' and...we will end up selling another 100,000 books directly to the UK." "The British defeated the Nazi's with planes and tanks and now they stoop to defeating ideas with censorship," he added. Conservative MP Nadine Dorries asked House of Commons leader Andrew Lansley to bring the issue of a book that "advocates the beating of children" to Parliament in a bid to pressurise Amazon into removing it from their website. I'm rising to ask you if you can use your good office to apply pressure on an issue which has come to my attention in the last 24 hours. It's regarding a book which is for sale on Amazon called To Train Up A Child by Michael and Debi Pearl. It actually advocates the beating of children under the age of 12 months using a switch. The book recommends that switch be cut from a willow tree and be no longer than 12 inches in length and 8cm in diameter. The book advocates the use of paddles, rulers and other means to beat children from four months onwards.